In this lesson we will learn how to apologize in Japanese. Note : Grammatically wrong but many people say this. You can use them in casual situations. = I’m very sorry for what I did. = I am so sorry. = I am deeply sorry. = I am truly sorry for what I did/have done/ what it happened. = Sorry I am late. = Kimi wo kizutsukete gomen! = Maggie sensei, omocha wo kowashite sumimasen. = Maggie sensei, I am sorry I broke your toy! I am sorry to have+p.p. = Sorry I have been late. = Kimi wo kizutsukete shimatte gomen! = I am sorry that I have hurt you. = Maggie sensei, omocha wo kowashite shimatte sumimasen. = Maggie sensei, I am sorry to have broken your toy! = Gomeiwaku wo okake shimashita. = Sorry that I troubled you. = Meiwaku wo kakege gomennasai/sumimasen/sumimasen deshita. = Gomeiwaku wo okake shite moushiwake arimasen deshita. = Minasama ni gomeiwaku wo okakeshite hontou ni moushiwake gozaimasen deshita. = I am sincerely sorry to have caused everyone all this trouble. Culture Note: You’ll hear this quote often in celebrity interviews when they cause some big problem. = Gomendou wo okakeshite moushiwake gozaimasen. = I am sorry to trouble you. = Shinapi (wo) kakete gomenne. = Sorry to make you worry! = Goshinpai wo okakeshite moushiwake gozaimasen. = Owabi no kotoba mo arimasen. = Kokoro kara owabi moushiagemasu. = Please accept my sincere apology. = Kono tabi wa goshinpai wo okakeshite owabi no kotoba mo arimasen. = I am sorry to make you worry. I don’t know how to apologize properly. = Will you forgive me, please? = Oyurushi itadakenai de shouka? = Will you forgive me? = Kokowa watashi no kao ni menjite douka oyurushi kudasai. = Please forgive him/her for my sake here. *勘弁して下さい。( = Kanben shite kudasai.) Please forgive me. When you want to apologize deeply, you have to lower your head. =to apologize kneeling down on the ground. Personally I only see this type of apologizing on TV drama or movies. Note : Here’s an extreme explanation ofjoke 土下座 ( = dogeza) video! = Daijin wa konkai no fushouji ni tsuite chinsha wo shita. = The minister apologized for the scandal. = Kare kara no shazai no kotoba ga nai. = There are no words of apology from him. = The person in charge should apologize. = Watashi no sei de gomennasai. = I’m sorry. It was my fault. = Kono aida wa shitsurei itashimashita. = I’m sorry for the other day. = Sonna tsumori wa arimasen deshita. = I didn’t really mean that. = Warugi wa mattaku arimasen deshita. = I didn’t mean it at all. = Waza to dewa arimasen deshita. = I didn’t mean it. = Kokoro kara hansei shiteimasu. = I’m sincerely sorry for what I did. = It’s OK!/ I’m OK! = Please don’t worry about it. =You don’t need to worry about it. = Mou goshinpai nasaranai de kudasai. = It’s not your fault. = Zenzen ki ni shite inai kara. = Zenzen kini shite imasen kara. = I don’t mind at all. = Taishita koto dewa arimasen kara. = Don’t worry! / That’s enough. = Kondo kara ki wo tsukereba ii kara. = Just be careful the next time. = Just forget about it now. / Just don’t worry about it. = Forget about it already! •も ( = mo) particle as well, too (as in 私も watashi mo(me too)). •食べちゃいました ( = tabechaimashita) casual ← 食べてしまいました。（ = tabete shimaimashita.) I have eaten. 許さない！ ( = Yurusanai!) ←私は、マギーを許さない。( = Watashi wa Maggie wo yurusanai ) I won’t forgive, you, Maggie. 端午の節句 ( = Tango no sekku ) ＋ Golden week! Nice and useful article! Thank you very much. I once made a blunder. I replied with “しょうがないね。” to someone who forgot an appointment with me. I meant that sometimes these things can’t be helped (a.k.a sh*t happens) and in no way intended to offend her. But she took it to mean “お前はしょうがない”. But good thing she understood what I meant eventually. I think しょうがないね is OK in that situation but if you stress　ね, it sounds accusing. I will be introducing myself at a professor from kyoto university. How do i make a proper introduction to him and thank him for coming all the way here. Also i want to say that i don’t really use keigo with my friends so i just want to say sorry if i offended him in any way. As for your self introduction, check my 自己紹介lesson. I am Sorry to bother, but I really want to sincerely apologize for not being able to finish a project(work related) I’ve promised my Japanese friend and his family. I know this my sound silly but I truly feel bad for the fact I cannot manage to keep this promise. I want them to know how sorry I am and how bad i feel that I cannot say in person. I used to stay in Japan for High school and have adopted the sincerity of how Japanese people treat others’ feeling with care, just haven’t been confronted with this kind of situation before so I don’t really know how to fix this. Please if you don’t mind helping me out, Thank you very much in advance. Are you thinking about writing a letter to them? I am not sure what kind of project but if you tell them why you didn’t do it and show your sincerity, I am sure they will forgive you. If you haven’t talked to then for a long time. ご無沙汰（ぶさた）しています。 Long time no see. お元気でいらっしゃいますか？ How have you been? = I am so sorry that I couldn’t keep my promise doing ~~~ that time. Sensei, thank you for your lessons! I was wondering if you could tell me how to say “I’m sorry too”, to someone who is apologizing to you? Okureru and osoi is when being late? Initially I thought osokunatte was used for objects only but I have heard people scold others for being late using osoi. Ex. Watashi wa aruku no ga osoi. = To be late to the class. = To be late (in time). Aruku no ga osokute gomennasai. = (Douzo) ayamaranai de kudasai. This kind of message is very sensitive. But personally if you use the word such as がっかり or 失望(=disappointment) , it may sound strong. By my unintentional actions I have troubled a young woman. I tried apologizing with words but due to miscommunication and misunderstanding, I made her even more annoyed. She is a Caucasian American married to a Japanese man. I was hoping after some time has passed that I would confront them and perform a dogeza before them to show honor and respect towards them both. Would this be all right to do or unnecessary? And what do I say while performing this act of apology? I don’t know what happened but as you said if you did something unintentionally and they are still angry because of miscommunication, then just apologize sincerely one more time. In my opinion Dogeza is a very old fashioned and too dramatic. You don’t need to do that. 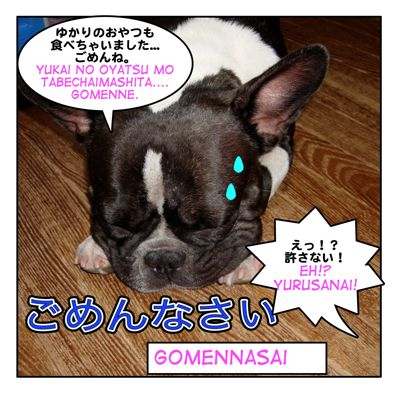 When I first learnt Japanese, my teacher taught me that Gomennasai is a more formal version of Sumimasen. However, it seems (from online resources) that gomennasai is more casual/childish? I recently inconvenienced my dorm manager by forgetting to tell her I was back home so she had to make a call to my room to ask for me. I apologised with Gomennasai and I have been worrying about it ever since because I am afraid it is too casual for the situation. Please help me in this issue. My dorm manager is older than me and we are not well acquainted yet, so in my mother tongue, I feel the need to apologise formally but I am confused about the degrees and nuances in Japanese. Please help to explain this for me! Thank you very much for your wonderful website. I will be learning a lot from it. Hello, Hal! Thank you for visiting our site. But the way you say is very important,too. If you apologize sincerely, either one works. So I don’t think you offended your dorm manager. = I will be careful from now on. I’ve heard that if you borrow an object and it breaks, even if you did not break it (e.g. it was old and stopped working by itself) it is polite to say “kowashite shimaimasita” and apologize. For example, you borrow a heater from your landlord and it stops working. Any thoughts on this? When would it be appropriate, when would it not be appropriate? We don’t want the Japanese person to misunderstand and think that we really broke the thing. If you haven’t even touched it and it broke by itself. What is the ‘masu’ form of wabiru? masu form of 詫びる(=wabiru) is 詫びます(=wabimasu). Thank you for the lesson, Maggie-sensei! ^__^ Your lessons are always full of useful information. 〜してしまいまして instead of してしまい? Which is used more often? It sounds more formal you usually don’t use it with すみません or ごめんなさい. Also you can separate the sentence. How do you say “Sorry the (object) is/are late” in japanese??? Please help it is pretty urgent! = Object osoku natte gomennasai. = Kurisumasu purezento osoku natte gomennasai. Are you OK? I hope you feel better now. If you don’t feel good, you have to apologize to me because you are not 元気! They’re very helpful! And me (14), and my older brother (16) benefit a lot from this amazing website ^___^ . Thank you for visiting this site and leaving a comment! Wow! 14 years?? It is so nice to hear young people like you and your brother are learning Japanese. Please feel free to ask me any questions using the comment section or twitter (Maggiesensei) gambatte! thank you very much! this is very helpful! Thank you for your comment, maru-chan! !ochame! Thank you for your comment. Many new lessons are ready to release. Please wait! My question today is, you wrote おやつ here, and I saw it somewhere in Kanji: 御八つ. Is there a reason why they are written differently? Does that change the context of the sentence?? Can you also write this word in Katakana? And if you do, does it change the meaning? The meaning is the same but we rarely use kanji now. We also write in katakana, オヤツ=oyatsu and it means the same thing. Writing words in Katakana makes them look more colloquial. What kind of おやつ do you like? I still make tons of English mistakes as you can see. :D I believe we can learn a lot from our mistakes. I only correct mistakes here for LOVE and I think you have been doing great! !Japanese smile!